Aric Attas, Interior Photography, Windsor, Vero Beach, Florida featured in the April-March issue of Vero Home, Life & Design Magazine. 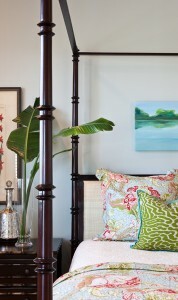 This is another of my favorite interior photographs from the April-March issue of Vero Home, Life & Design Magazine. The image is a detail of the Master Bedroom in one of the townhouses in Windsor featuring the designs of Susan Hastings & Deb Daly. I really enjoy the color palette and warmth of the home.